Between 1944-1945, Communism took over the Christian country of Romania. An experiment of terror was performed on the young generation, on students from the age of eighteen to twenty five. Among those students was a man who is alive today after surviving sixteen years in the anti-human communist prison system. His name is Father George Calciu. After His release from prison, he was exiled to America in 1984. Below follows part of an interview by Nun Nina from this year (1998). Nun Nina: This may be more difficult for you to talk about – I know a little bit about what happened there and the whole experiment of re-education that took place. Can you tell us about what happened? Fr. George: Communism wanted to make a gap between the generations. The most dangerous category for them was the students, the young people. We had inherited a Christian education, family values, and basic Christian principles. The older generation was a generation that had to die, but this generation had to be transformed. So they tried to experiment in a very concentrated medium. They wanted to break the people, the whole country. Romania was not a primitive country. We were connected to European culture. We believed in Christian values. Therefore, they wanted to do this special experiment with the young people, to create a gap between the children and the older generation, to make this generation of students a communist one. They wanted to build a new world – a communist world; a new man—the communist man and so on. Se the arrested the young people – the students – and put them in a special prison for this very experiment. They took very distinct steps. The first was to destroy the personality of the youth. For example, the guards would come together with a group of young prisoners who had converted to communism in a cell where there were perhaps twenty young students and try to intimidate them. They would beat without mercy. They could even kill somebody. Generally they would kill one of them – the one who opposed them the most; the most important one. Generally he was a leader. They would beat him and even kill him. Thus, the terror began. After that, they began to “unmask.” They wanted to force you to say: “I lied when I said, ‘I believe in God.’ I lied when I said, ‘I love my mother and my father.’ I lied when I said, ‘I love my country.’” So everyone was to deny every principle, every feeling he had. That is what it means to be “unmasked.” It was done in order to prove that we were the products of the bourgeois, and the bourgeois are the liars. We lie when we say we are virgin, we are Christian, and when we try and preserve our bodies for marriage. They tried to say I was a prostitute, a young man that had connections with the all the girls. We would be tortured until we denied everything we believed before. So, that is what it means to be “unmasked.” It was done in order to prove that Christian principles we not principles, that we lied when we said we loved Jesus Christ, we loved God, mother, father, and so on. It was to show that I lied when I said that I was a chaste man, when I held the ideal of nation and family. Everything had to be done to destroy out souls! This is the second step. After this came a declaration against everybody who was in touch with us, everybody who believed as we believed. I was to make a declaration against everybody who knew about my organization or my actions, to denounce everybody—even father, mother, sister. We were to sever completely any Christian connection and moral people. The final step was to affirm that we had given up all the principles of our faith and any connection we had with it. With this we began to be “the new man,” “the communist man,” ready to torture, to embrace communism, to denounce everybody, ready to give information, and ready to blaspheme against God. This is the most difficult part, for under terror and torture one can say, “Yes, yes, yes.” But now, to have to act? It was very difficult. It was during this third part that many of us tried to kill ourselves. Nun Nina: This is when you tried to commit suicide? Father George: Yes, this was the most difficult part. Thus was a new category of man built by communism. And we were forced to go with some of our former torturers into another cell and start doing to same thing. It was very difficult. It was a very devilish directive. At this time we could not understand the mystical implications of this action. We are political prisoners and the communists wanted to learn everything about us—about our friends, our families—because the majority of the people were against them. They wanted to strike terror in them and in the country. Only later did we understand that there were mystical implications. All these people were just instruments of the devil. After the actions had stopped, some of us understood. But, we were too involved with the political fight before we were in prison. Even if I and others protested against the introduction of materialism into the schools and the forbidding of the students to go to Church, I think the majority of our effort was being involved in the political fight. However, little by little, under the terror, the torture, and suffering, we understood that this political implication was just the surface. In fact, it was a fight between good and evil; between God and the devil. When we understood that, we started praying even more than before. God sent us illumination. We understood it and we were aware of the nature of this fight. We understood that it was not [a name] was our enemy—it was the devil. He tried to destroy our soul. It was not just a political fight for someone’s struggle for power. They wanted to destroy our soul, our faith, our spiritual connection with our families. We understood this and we tried to resist. We were fighters—very strong, courageous, and faithful. So there were four steps: the instillation of terror, the unmasking, the denouncement of other people, and, afterwards, the changing of our souls. These four steps were strictly thought out and planned. It could not be only in the images of the mind. They had long experiences of this in Russia and were now bringing it to Romania. We had not right to work. They had no interest in our body. Our body was just an instrument through which to reach our soul. They interested in our faith, in the destruction of our souls. There was no torture moral and physical that was not used. But you can pass through the tortures. The problem for us was the moral problem. To deny Faith, to deny everything, to say that all my life was only lies. To deny every Truth, the real Truth you believed before. To say now that it was not true, it was a lie. This was a problem for many, for we can pass through the tortures—or we can die. But, to survive, and to deny everything you believed in before, everything that was the cornerstone of your soul. This was our difficulty. When you were tortured, after one or two hours of suffering, the pain would not be strong, but after denying God and knowing yourself to be a blasphemer—that was the pain that lasted. Spiritual pain is more difficult to bear than bodily pain. Nun Nina: Where there moments when you thought you were going to lose your mind or go insane? Nun Nina: What did you do? How did you even pray during those moments? Father George: One cannot pray during those moments. But during the night, when everyone goes to bed, you gain your strength and find your repentance. You pray for this. It is not complicated. You say, “God forgive me!” It is enough for your soul to regain its strength and resist one more day… and one day more… and one day more. Not to die. Not to go crazy. Many of us went mad. But just to say, “Forgive me, God.” You knew very well that the next day you would again say something against God. But a few moments in the night, when you started to cry and to pray to God to forgive you and help you was very good. Many times we were quite angry with God—if you exist why did you allow this? But there was one moment when the mercy of God would come upon you and you could say, “God forgive me; God help me.” It was enough to help you. For another day, another day, another day. We were freed and we were very happy to be free, but we had a kind of nostalgia about the prison. And we could not explain it to others. They said we were crazy. How could you miss prison? Because in prison, we had the most spiritual life. We reached levels that we are not about to reach in this world. Isolated, anchored in Jesus Christ, we had joys and illuminations that this world cannot offer us. There are not words to express exactly the feeling we had there. Many times we were not happy at all, but there were moments of happiness there. When I took care of Constantine Oprisan in the cell, I was very happy. I was very happy because I felt his spirituality penetrating my soul. I learned from him to be good, to forgive, not to curse the torturer, not to consider anything of this world to be a treasure for you. Can you imagine—we were in a cell without windows, without air, humid, filthy—yet we had moments of happiness that we never reached in freedom. 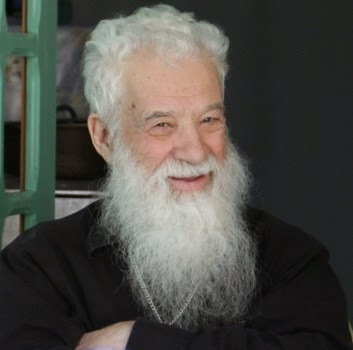 Father George Calciu, a priest of the Romanian Orthodox Church, died on November 21, 2006, in Alexandria, Virginia of pancreatic cancer at the age of 80. I met him only once, over a weekend in Seattle, now nearly two decades ago, but he had a profound impact on my understanding of the priesthood and the witness a priest must give to the Truth of the crucified Christ. He spent 21 of his 80 years in prison in Romania because of his faith in Christ. general amnesty issued by the government in 1964. What were these years like? First, a team of guards and "experienced" prisoners would beat the incoming prisoners and kill one or two, whoever appeared to be a potential leader. Next, the new prisoners were required to "unmask" – the prisoners were required, under torture, to verbally renounce everything they believed about God. Third, prisoners were forced to denounce everyone they knew, including their family. 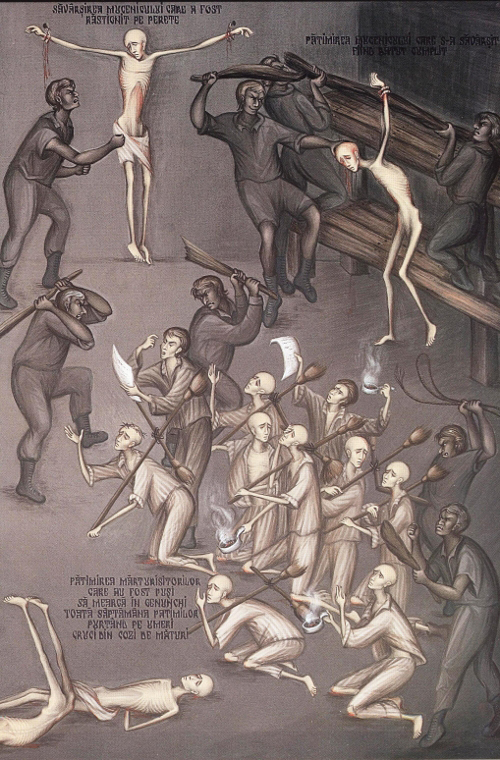 The abuse never ceased, not even in one's cell, and every imaginable torture was employed. Last, in order to show that they had been "re-educated" and become "the communist man", the prisoners were required to join in the ranks of the torturers and assist in the "reeducation" of new prisoners. "It was during this fourth part that the majority of us tried to kill ourselves," Father George confessed. During these 16 years in prison, he came to admire the priests who were jailed with him and his faith, in spite of the brutality of his surroundings, grew and deepened. It was in the Pitesti Prison that he came to the realization that he was called to the priesthood. "The priests were better prepared than we were. They knew what suffering was. They were prepared for it. They brought forgiveness to us, so to speak. I decided to dedicate the remaining years of my life to God and to become a priest". After his release from prison, he married his wife, Andrea, in 1965. Initially forbidden by the government to study theology, he instead studied at the Faculty of Philosophy and Literature for four years and received a degree in French. Eventually, he was allowed to pursue a doctorate in theology with the blessings of Justinian, then the Patriarch of the Romanian Orthodox Church. "Justinian was amazing", Father Calciu once said. "He was very strong in his stand against the political administration, very strong. He made it possible for some of us to study theology." Father Calciu was ordained to the priesthood in January, 1973 at the age of 48. 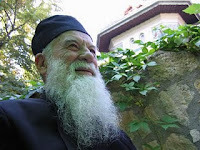 After receiving his degree in theology, he was appointed by Patriarch Justinian as a professor at the Theological Seminary in Bucharest where he taught French and New Testament studies. He remained vocal in his criticism of the atheistic communist system, condemning the destruction of churches and widespread violation of human rights under the Ceausescu regime. "I declared communism, together with Marxism and materialism, to be a religion, a philosophy of hopelessness and despair, because a regime that demolishes churches to build taverns is a regime that has lost the notion of its true mission." Ceacusescu tolerated his pro-Christian, anti-Marxist sermons for the next few years, but following the death of Patriarch Justinian in 1977, conditions for the church worsened as the state tightened its control. In the winter of 1978, Father Calciu announced plans for a series of 7 sermons during Lent, specifically addressing young people about religious faith. In these sermons, with as many as 600 people present, he contrasted what he called "the fullness of the Gospel life" to "the lies of materialism as a doctrine and the communist ideology of hatred." Because of these sermons "Ceausescu saw me as his personal enemy", Father Calciu later recalled. He was abruptly dismissed from the seminary for preaching these sermons in 1979, arrested, tried and sentenced to 10 years in prison. Severely mistreated, often beaten and placed in solitary confinement for months at a time, he was finally released by the Romanian government in 1984 under pressure from international political and religious leaders (Ronald Reagan, Margaret Thatcher and Pope John Paul II) and was forced to leave Romania in 1985. 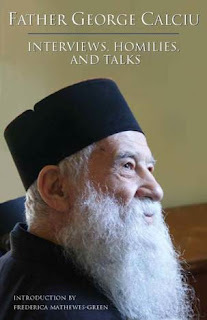 He immigrated to the United States and eventually settled in Virginia with his wife and son, Andrei, where he became the pastor of Holy Cross Romanian Orthodox Church. What was his life like during this second imprisonment? Below is an excerpt from an interview he once gave about those years: "I was completely isolated in my cell. I knew nothing about my family. I was surrounded only by the hatred of the guards. Twice a day I was walked to the restroom to empty the tineta (a wooden or clay bowl which served as a latrine bucket). Those walks were the worst torture I experienced. I was insulted, hit and sometimes beaten; it happened that the contents of the tineta spilled onto the concrete and I was then forced to clean it up with my bare hands. "For the preaching of the cross is to those that are perishing, foolishness; but unto us who are saved, it is the power of God. (l Corinthians. l:l8). It was one Sunday and I was isolated. It was one of the days without food and I couldn't serve the Divine Liturgy because I had no bread. The Orthodox Liturgy is celebrated with bread and wine, and the central moment is then when the Holy Spirit descends and transforms bread and wine into the Body and Blood of Christ in a real though invisible way. In prison we had no wine, but we had bread and through necessity because of these extreme circumstances, I felt my service was complete. On that Sunday I asked the Lord to help me forget my sadness at the impossibility of serving the Holy Liturgy for lack of bread. Nevertheless, a thought came to me: to ask the guard for some bread. The most evil of the guards was on duty and I knew that my request would make him angry; he would insult me and he would ruin the peace I had in my soul for that holy day. But the thought persisted and grew so strong that I knocked on the iron door of the cell. A few minutes later the door was violently opened and the furious guard asked me: what was the matter? 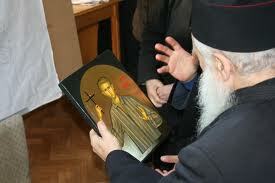 I asked him for a piece of bread, no more than an ounce, to use for serving the Holy Liturgy. My request seemed absurd to him; it was so unexpected that his mouth dropped open in amazement. He left slamming the door as violently as he had opened it. Many other hungry prisoners asked him for bread, but I was the first to ask for bread in order to serve the Divine Liturgy. I regretted my impulse, apprehensive about what would happen next. Twenty minutes later the door of my cell opened half-way and quietly the guard gave me the ration for a whole day: four ounces of bread. He shut the door as quietly as he had opened it. And if I had not been holding the bread I would have thought that it was all an illusion. The Holy Liturgy I celebrated with that bread was the most profound and most sublime Holy Liturgy I have ever experienced. The service was two hours long and the guard did not disturb or insult me as at other times. Later, after I had finished the Liturgy and the fragrance of the prayer was still in my cell, the door opened quietly and the guard whispered: "Father, don't tell anyone I gave you bread, or you'll ruin me". I responded: "How could I tell this to anybody, mister first sergeant? You acted as an angel of God because the bread you gave me became the Body of Christ and your deed is now recorded in eternity." Without answering, he quietly shut the door, looking at me until the last moment. After that he never insulted me and during his eight hours of duty I had the most peaceful time of my imprisonment. I have related this double aspect of my confinement--the suffering and the divine consolation--to make you understand that God secretly balances our lives. If we have God we shall never collapse from the pain of this world. During our most atrocious suffering we suddenly discover oases of light and sacred joy. If the world oppresses us, then Jesus comforts us; if we are sad, our joy is Jesus." Αναρτήθηκε από ΝΕΚΡΟΣ ΓΙΑ ΤΟΝ ΚΟΣΜΟ στις 11:14 π.μ.